A magnitude 7.1 earthquake stunned central Mexico on Tuesday, killing at least 79 people as buildings collapsed in plumes of dust. Mexico&apos;s civil defense agency says the death toll has risen to 226 from Tuesday&apos;s magnitude 7.1 earthquake that knocked down dozens of buildings in Mexico City and nearby states. The official Twitter feed of agency head Luis Felipe Puente said early Wednesday that 117 people were confirmed dead in Mexico City, and 55 died in Morelos state, which is just south of the capital. It said 39 are dead in Puebla state, where the quake was centered. Twelve people died in Mexico State, which surrounds the capital, and three in Guerrero state. The count does not include one death reported by officials in Oaxaca state. The U.S. Geological Survey said the magnitude 7.1 quake was centered near the Puebla state town of Raboso, about 76 miles (123 kilometers) southeast of Mexico City. The Philippines says the powerful earthquake that rocked central Mexico has badly damaged its embassy in Mexico City, but the staffers were unhurt and there are so far no reports of casualty among the 60 members of the Filipino community in Mexico City. It is also offering its sympathy to Mexico following Tuesday&apos;s powerful earthquake that killed at least 149 people and collapsed dozens of buildings in the capital and nearby states. Presidential spokesman Ernesto Abella says: "Our thoughts and prayers are with the people of Mexico, especially the bereaved families, who were hit and affected by a magnitude 7.1 earthquake." Philippine Ambassador to Mexico Eduardo de Vega says he and the embassy staff rushed out of the building when debris started falling and they all escaped unhurt. The Philippine Embassy occupies the first two floors of an eight-story office building in Mexico city&apos;s Cuauhtemoc neighborhood. Mexico&apos;s president has issued a video statement urging people to stay calm in the aftermath of the powerful magnitude 7.1 earthquake that toppled dozens of buildings in Mexico City and in nearby states. President Enrique Pena Nieto said in the message issued late Tuesday night that many people will need help, but the initial focus has to be on finding people trapped in wrecked buildings. In his words, "The priority at this moment is to keep rescuing people who are still trapped and to give medical attention to the injured people." The earthquake occurred just two weeks after a magnitude 8.1 tremor in the south of the country caused more than 90 dead and caused buildings in Mexico City to sway for more than a minute. Tuesday was also the 32nd anniversary of the devastating 1985 earthquake that killed thousands of people in the capital. Mexico&apos;s president says 22 people have died at a school that collapsed in the nation&apos;s capital due to Tuesday&apos;s 7.1 earthquake. President Enrique Pena Nieto said that two of the bodies found were adults. It&apos;s not clear whether the deaths are already included in the overall toll of at least 149 across the country. Pena Nieto visited the school late Tuesday. He said in comments broadcast online by Financiero TV that 30 children and eight adults were still reported missing. Rescue workers were continuing to search and listening for sounds from the rubble. The head of Mexico&apos;s civil defense agency says the nationwide death toll from Tuesday&apos;s earthquake has risen to 149. Luis Felipe Puente said 55 people died in Morelos state, just south of the capital, while 49 died in Mexico City and 32 died in Puebla state, where the quake was centered. Ten people died in Mexico State, which surrounds the capital, and three in Guerrero state. The count did not include one death reported by officials in Oaxaca state. MEXICO CITY (AP) - A magnitude 7.1 earthquake stunned central Mexico on Tuesday, killing at least 79 people as buildings collapsed in plumes of dust. Thousands fled into the streets in panic, and many stayed to help rescue those trapped. The quake came less than two weeks after another quake left 90 dead in the country&apos;s south, and it occurred as Mexicans commemorated the anniversary of a 1985 quake that killed thousands. At least 11 others died in Puebla state, according to Francisco Sanchez, spokesman for the state&apos;s Interior Department. "We saw this and came to help," he said. "It&apos;s ugly, very ugly." Alma Gonzalez was in her fourth floor apartment in the Roma neighborhood when the quake collapsed the ground floor of her building, leaving her no way out - until neighbors set up a ladder on their roof and helped her slide out a side window. Local media broadcast video of whitecap waves churning the city&apos;s normally placid canals of Xochimilco as boats bobbed up and down. Mexico City&apos;s international airport suspended operations and was checking facilities for any damage. 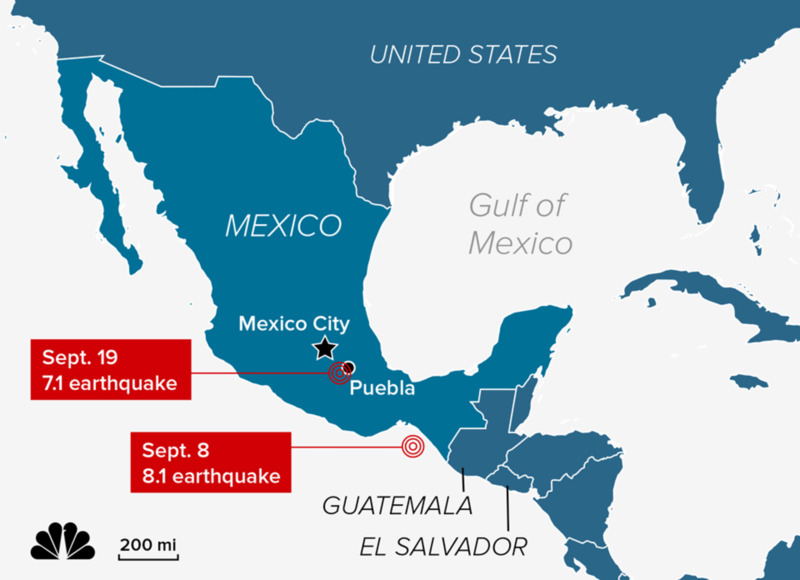 The new quake appears to be unrelated to the magnitude 8.1 temblor that hit Sept. 7 off Mexico&apos;s southern coast and which also was felt strongly in the capital. There have been 19 earthquakes of magnitude 6.5 or larger within 250 kilometers of Tuesday&apos;s quake in the past century, Earle said. Initial calculations show that more than 30 million people would have felt moderate shaking from Tuesday&apos;s quake. The US Geological Survey predicts "significant casualty and damage are likely and the disaster is potentially widespread."